Having watch Trigun in its entirety and thinking about what I’d seen. It seemed to me like there is a clear split between the first DVDs and the last few. The first are more cheerful, probably to compensate for the seriousness of the latter few disks. Having watched Trigun I couldn’t help but wonder of the importance of the cat. You know the scary fella with the humongous eyes. Anyway I enjoyed Trigun because it gives an anime style approach to the old American Wild West. 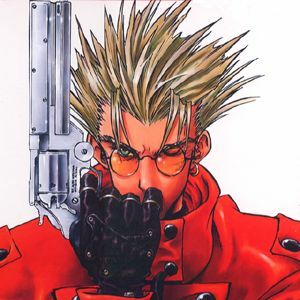 Vash the Stampede: The guy in the picture above said to be worth a $60,000,000,000 bounty. However, the clumsy and joking exterior, hides a well oiled killing machine. Meryl Stryfe: She works for the Bernaldelli Insurance Society and has been assigned to find Vash the Stampede, to minimise the damage caused by him. Milly Thompson: A very tall but kind of simple woman who is Meryl's partner. She carries around a huge riot cannon type weapon.